If a picture is worth a thousand words, the the following 11 pictures should sum up our evening … (I apologise for the picture quality – it’s cringe worthy, but I just had my cell phone). Last night Michael and I enjoyed an evening out at The Marc to celebrate my birthday. He left it to me to decide our destination, and thought we should try something new. The Marc has been open since last October, and is located on the southwest corner of 100th Avenue and 106th Street. Although they have no parking lot of their own, there is ample (metered) street parking (free after 6 o’clock) and a smattering of pay lots that surround the place. We were happily greeted at the door as soon as we arrived, and while Michael sorted out our coats for hanging (he’s particular you see), I chatted with our greeter and discussed the place for a few minutes. As you arrive, you notice to the right a less formal seating area, a few tables for two, and a larger table for six or eight. It was explained this area was quite popular at lunch time for those that run in for a quick bite and don’t have reservations. A person could end up sitting at the large table with a few other singles or pairs, which is a nice idea, especially for the solo diner. There is a small bar that seats about four or five people, and a person would be made most welcome to come in after work for a nice, quiet, relaxing drink without having to worry about feeling pressured to have a meal. The bar is fronted by marble that was gleaned from the CN tower, and is a nice touch to have a bit of something historical in such a modern place. The interior is clean, fresh and minimal. The lighting is perfect and the seating is arranged with just enough personal space between tables, yet close enough to seem intimate. Server staff were relaxed and comfortable, friendly and easy to talk to. Menus are presented on clipboards, and the specials were recited with much love and enthusiasm by our server. She aced table-side romance to a tee. And in case your mind got stuck replaying “in a gorgeous tarragon sauce” over and over, so you didn’t quite pay attention to the rest of the specials, they were also written on a chalkboard on the back wall for future reference. 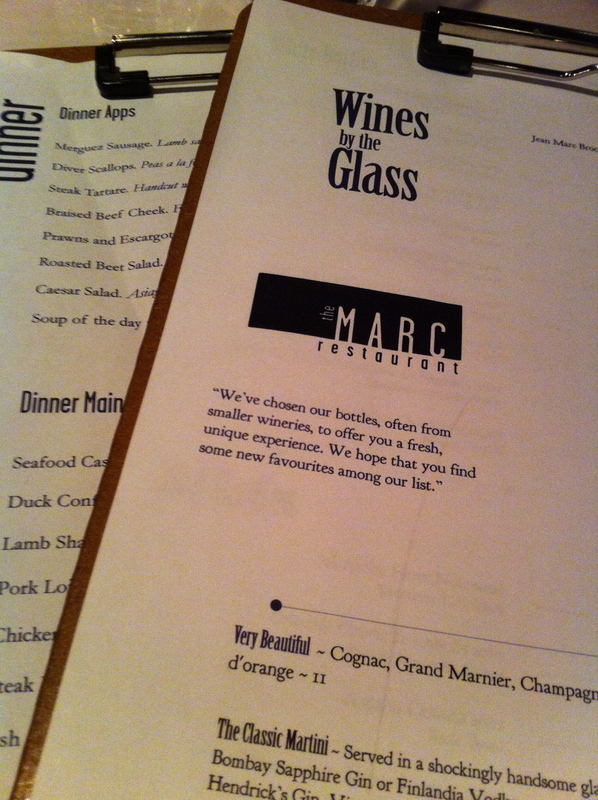 The Marc has a nice selection of wine available (including the very retro Mouton Cadet, available by the glass). 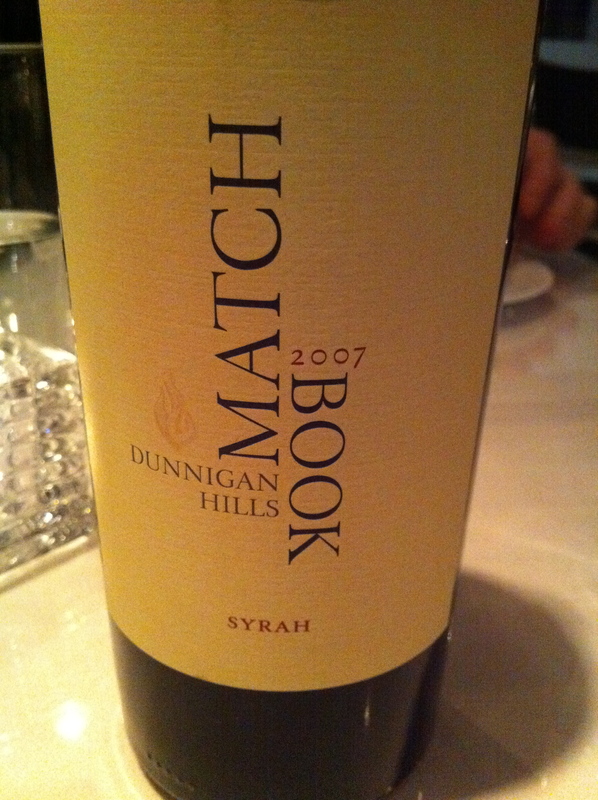 We selected a inexpensive bottle of syrah as we thought it would be flexible enough to pair with fish or beef nicely. The bread was out of this world fresh, and we forgot to ask if they made it themselves, or if they opened a “new bag”. The reference to a “new bag” is a throw back to a dinner we had at The Keg last year. Our bread was dry, and the server eagerly took it away and returned with a fresh basket and declared, “This should be better, I opened a new bag”. 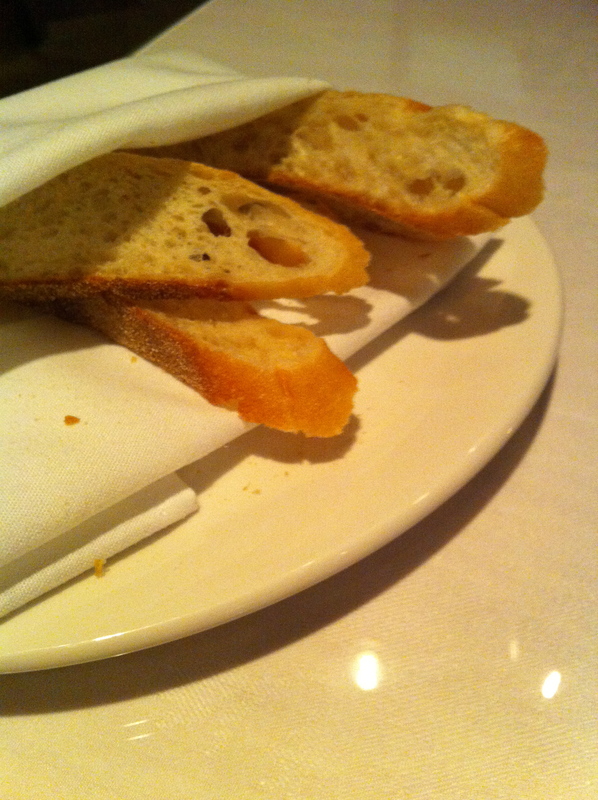 But back to The Marc, their bread was exceptional no matter where they found it. Michael chose to start with mussels that were served in a yummy, if not a bit salty, wine broth along with several pieces of toasted crostini. 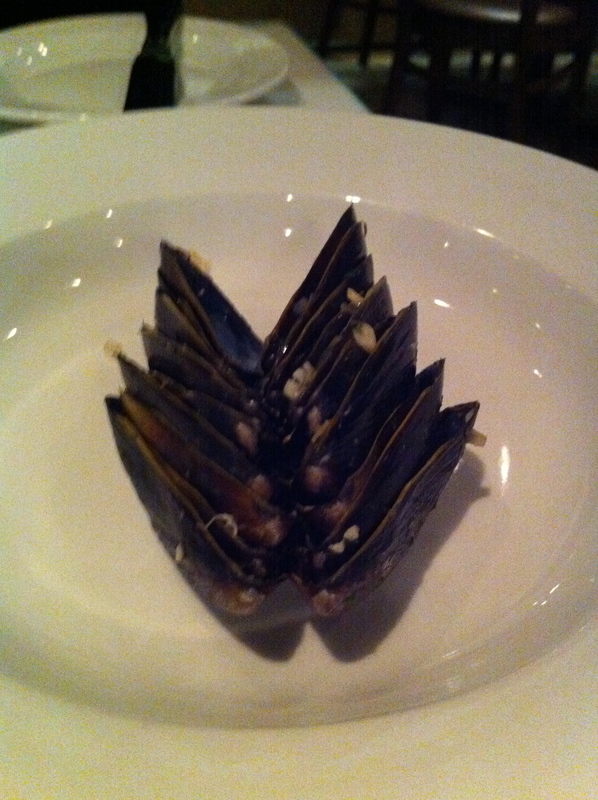 I tried one, and I will not say what I thought as I’m not into mussels in the least, but as Michael dug in and artfully arranged the empty shells, he was happily nom noming and sighing with enjoyment, with only one slight upset when he dropped a mussel on the floor and you could see him agonize about his loss. 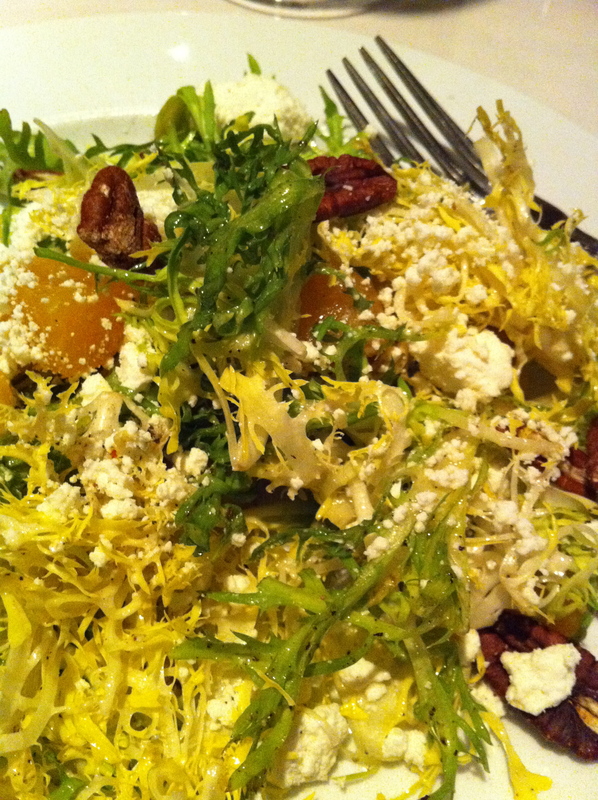 I selected a roasted beet salad, which was zingy with the vinegar, sweet with the beets, crunchy with the toasted pecans, and creamy with the goat cheese. I ate ever last morsel, and if all salads tasted that delicious I would eat salads exclusively and be thin, wear lots of jewelry, have my nails tended to weekly, and have a pet Yorkie in my purse. For our main, Michael selected Steak Frites (steak with fries), that was cooked to perfection (and he wasn’t even asked “how do ya want yer steak dun hun”). 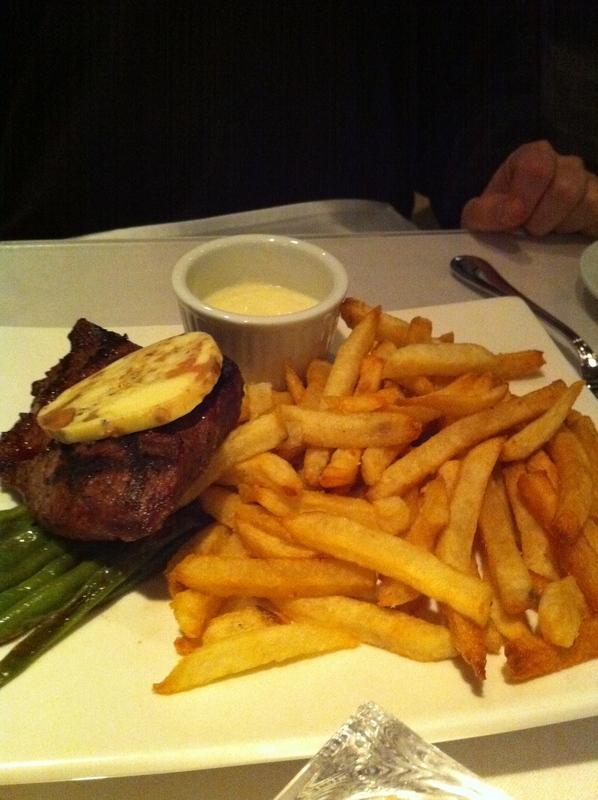 It was served with a lovely slice of foie gras butter and a little tub of aioli for dipping the fries. 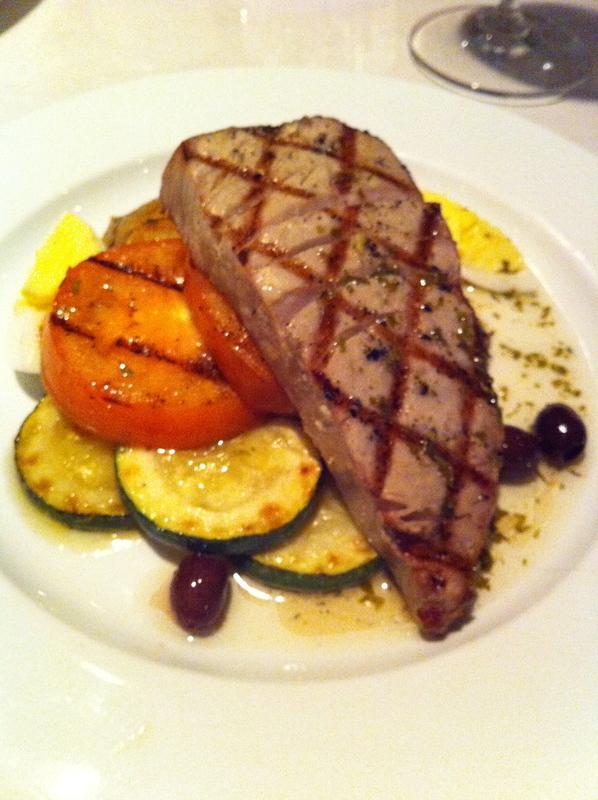 I selected the Ahi Tuna which was served with roasted veg and aforementioned tarragon sauce. Out of this world delicious. The plate was presented with sliced grilled tomato, grilled zucchini, adorable little black olives, and sliced egg. Oh allow me a moment to remember before I carry on…. I’m back. 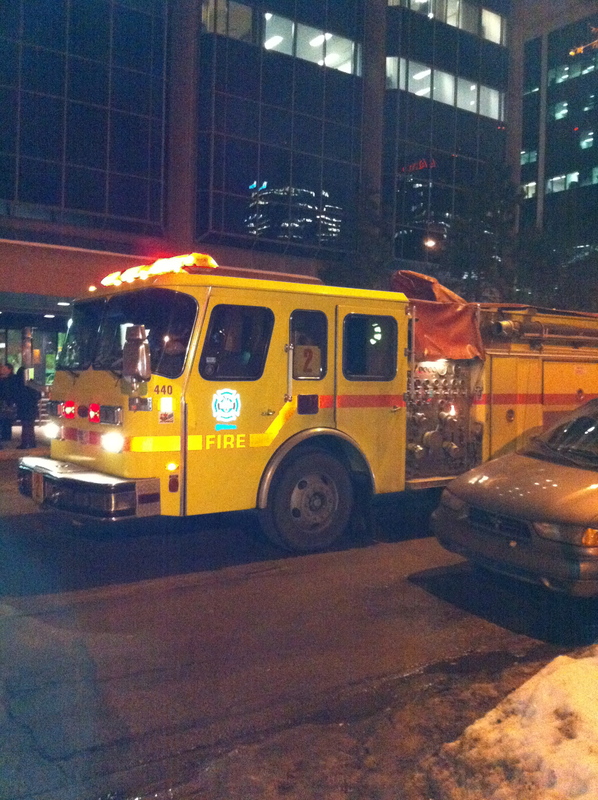 Just as Michael and I are finishing our main, seriously, the timing couldn’t have been better, the fire alarm goes off. And like a bunch of fools we all sit around and carry on like nothing’s happening. Our server came around to assure us all was well, and promised if it were a real alarm she would grab us two bottles of wine and we’d make a run for it (I’m still waiting for her to follow-through on this). 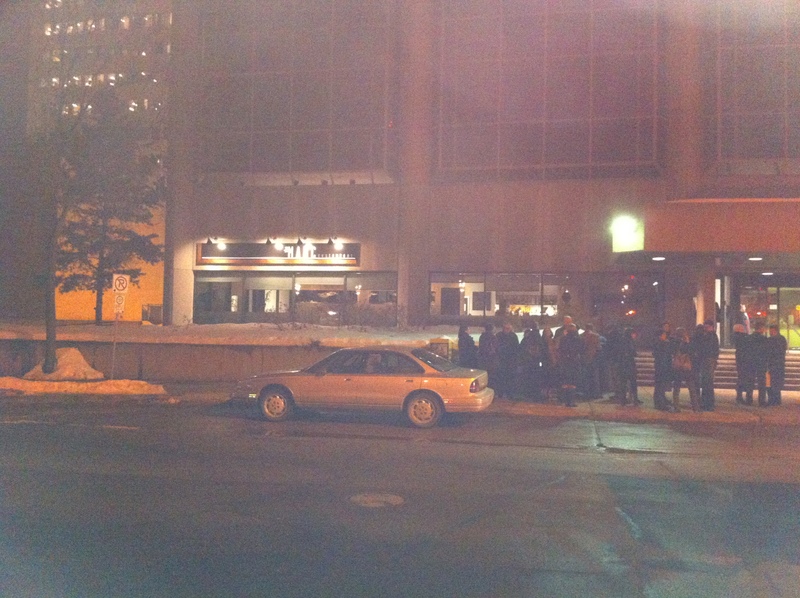 Well, after a few minutes people decided the alarm could no longer be ignored, and staff started to go outside to see what’s up, and next thing you know, we are being herding out of the restaurant onto the street. Within another minute or two the fire department arrives to do their thing. Patrons were huddled together on the sidewalk and the mood turned quite festive as it does when one thinks the building they are standing beside is going to burst into flames at any moment. We couldn’t have been outside more than 15 minutes, and just when it started to feel a bit chilly, we were given the all clear and allowed back in. As Michael and I observed a young couple take off rather quickly when we were all ushered outside, I asked our server if they had many dine-and-dashers that evening. And I’m happy to report other than that first couple, a second couple left with the promise to return the next day to pay, and a pair of men left and returned the same evening. Our server was relieved with this pair in particular because they had ordered a very expensive bottle of wine. As I warmed my hands over the candle, it was time to decide on dessert. 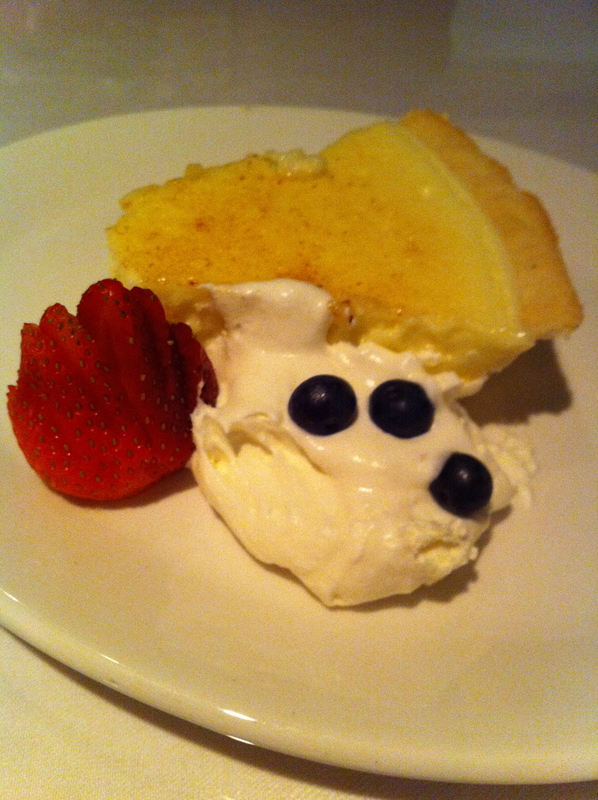 Michael will always, without fail, selected the item with lemon in it, and he followed through with a lemon tart. Michael was rolling his eyes in delight and oohing and ahhing throughout and wasn’t too generous in sharing bits of it with me. I chose a dark chocolate cake with a caramel, salted walnut centre, all bathed in a film of chocolate ganache. It was the chef’s grandmother’s recipe. I love this person’s grandmother. I usually avoid the chocolate things, but I adore the combination of salt and caramel, so couldn’t say no. It was a lovely piece of cake that was. Rich, dark, moist, chocolaty and not over-sweet. Our desserts were comped for the earlier hubbub, and was gratefully appreciated. Just as we were leaving Patrick Saurette (he owns the place) came out and was doing rounds to the tables, and he was greeted as an old friend to the people he visited. We should have hung around and introduced ourselves, but at this point it was time to go. We will try to catch him next time. Because believe me, there will be a next time. Previous Post Made it to 44. Again. Next Post Raisin Pie for Afternoon Tea! Sounds like a perfect birthday celebration! (Well, apart from the fire trucks). YOU have sold me! 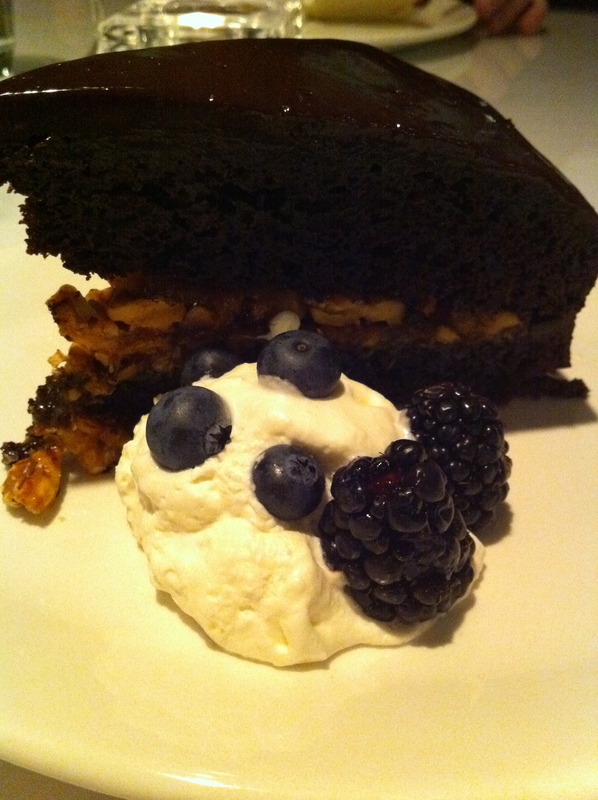 Not those pics… Ths chocolate cake looks like an authentic mud pie! Glad you had fun and HAPPY fffffffforty fffffour!